Today's gown belongs to something of a backstage royal - one of those that never grabbed the main headlines, but was always working away behind them - who had a rather backstage wedding. 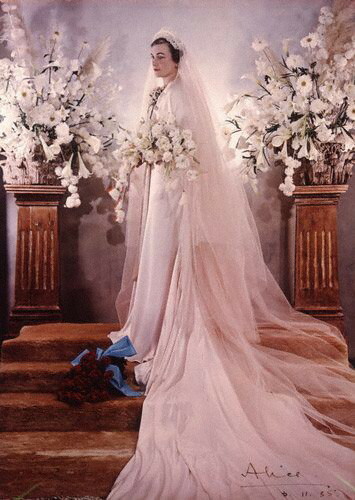 But despite all of that, this gown would lead to a royal trend that lasted for decades to come. And yes, it is pink. It was an unusual colored gown, but she was something of an unusual bride. As the daughter of the largest landowner in Scotland, the Duke of Buccleuch and Queensberry, Lady Alice Montagu Douglas Scott grew up alongside her future husband, the third son of King George V and Queen Mary. But despite her aristocratic background, Alice was no typical royal bride - by the time she married, she was 34 years old (quite old for the time - oh, how things have changed!) and had traveled the world for years. 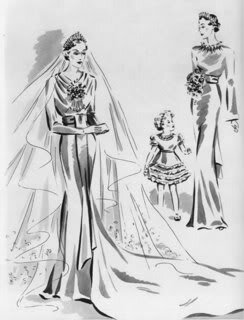 The particular significance of this dress is due to its designer: Norman Hartnell. Today that seems like a "typical" royal choice, but Alice's dress was actually the first major royal commission for the royal couturier. It led to the then-Duchess of York (the future Queen Elizabeth, the Queen Mother) visiting his studio and ordering a few frocks, which in turn led to work for Queen Mary. 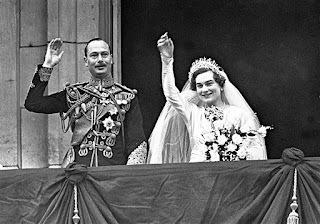 Eventually, all of this led to his becoming the sole man in charge of the style of the major royal ladies for decades, including such significant royal milestones as wedding gowns for both Princess Elizabeth and Princess Margaret, and the coronation gown of Queen Elizabeth II. 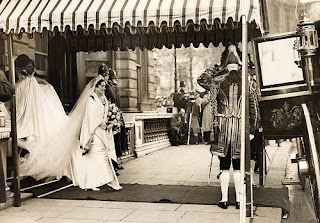 Owing to her age, Alice did not want to marry in a pure white gown - a desire certainly enhanced when her father died only a few weeks before the wedding day. So, Hartnell created a satin gown in a pearl pink shade with a matching tulle veil and an unusual cluster of orange blossoms at the neckline. 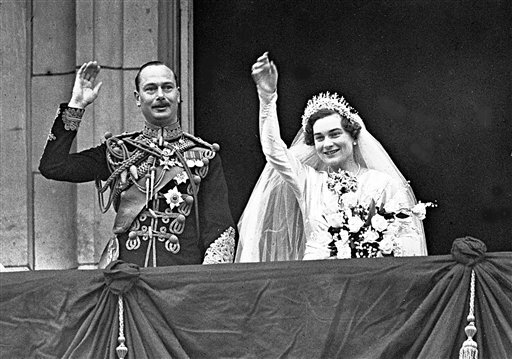 On her head she wore a crystal headdress specially made for the day instead of a regular tiara. Her father's death was a shadow over the day itself. A planned public ceremony at Westminster Abbey was scratched in favor of a wedding in the private chapel at Buckingham Palace, though the bride did still make her entrance in the glass carriage and there was still a balcony appearance afterward. 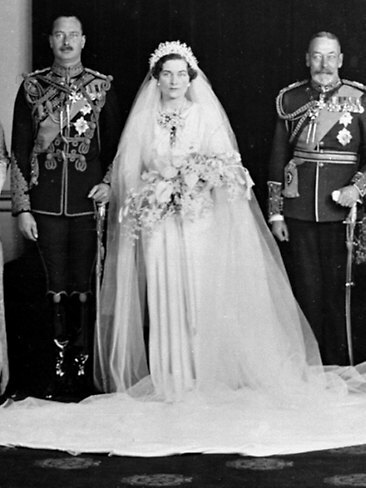 The whole affair took a backseat to the more glamorous nuptials of Henry's younger brother Prince George, Duke of Kent, and his wife, Princess Marina of Greece and Denmark the year before. 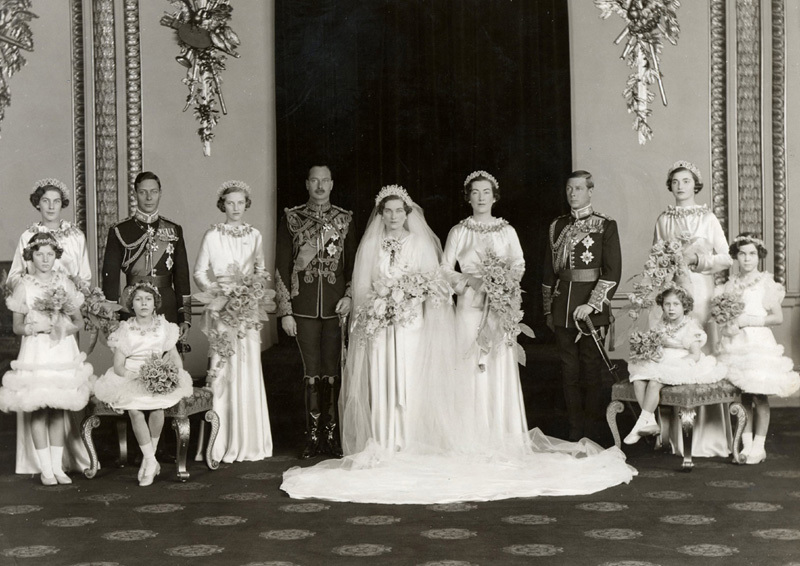 In fact, the Gloucesters would stay in the background of the family, still dutifully going about their royal business, for the rest of their lives. They had two children, Prince William (the oldest) and Prince Richard. William died in an airplane crash at the age of 30, in 1972; Prince Richard became the current Duke when his father died in 1974. 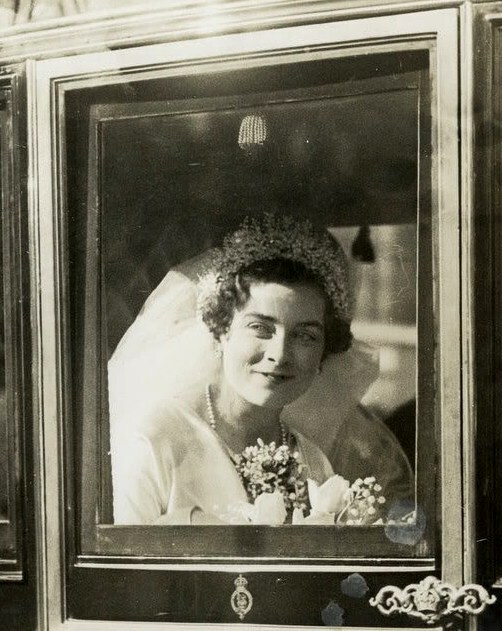 After her husband's death, Alice was granted the courtesy title of Princess Alice, Duchess of Gloucester by the Queen, despite the fact that she was never a princess of the blood herself (she didn't want to be known as the Dowager Duchess of Gloucester, and this move gave her the same styling as her sister-in-law Princess Marina). 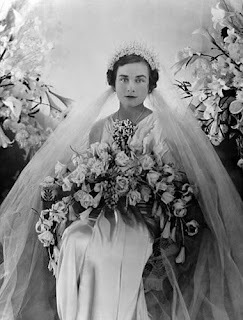 She died in 2004; at 102 years old, she was the oldest living royal in history. What do you think of Alice's pink concoction?